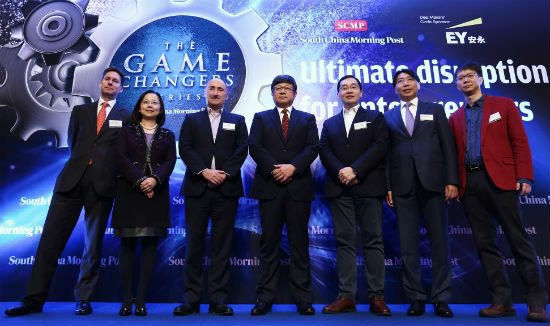 The SCMP Group Ltd (SEHK: 583), Asia’s leading media holding company, yesterday launched the Game Changers Series, an array of thought leadership forums that highlights innovative entrepreneurship and fosters a culture conducive to business innovation in Hong Kong. The Game Changers Series is a platform that garners investors, entrepreneurs, intrapreneurs, policymakers, industry experts and stakeholders to share insights, success stories and best practices and shed light on challenges and the best way forward. It comprises four innovation-themed forums – the first of which was held yesterday – in which macro policy implications, entrepreneurial mindset, funding and breakthrough go-to-market strategies and many more related topics will be discussed. To mark the opening of the inaugural Game Changers Series yesterday were (from left) Nick Edwards, SCMP Business Editor; Agnes Chan, Managing Partner, Hong Kong & Macau, EY; Simon Galpin, Director-General of Investment Promotion, InvestHK; Robin Hu, CEO of SCMP Group; Dr Edmund Lee, Executive Director of Hong Kong Design Centre; Anthony Leung, Assurance Partner, EY; and George Chen, Managing Editor of SCMP.com international edition. Three remaining Game Changers forums will follow on 25 June, 17 September and 10 December. For details, please visit gamechangers.scmp.com or contact conferences@scmp.com /+852 2680-8902.